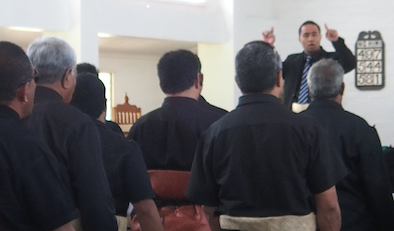 in the Neiafu Wesleyan church in Tonga. Children wriggle. Mobile phones buzz inappropriately. Phone cams record. Microphones cue. The girls wear their very best frocks. The boys are as neat and clean as they can be. Adults are for the most part, somberly (our in our case, more conservatively) dressed. The conductor gazes at his musicians, raises his hands, the music begins…. If it’s Sunday in Tonga, it all transpires in church. 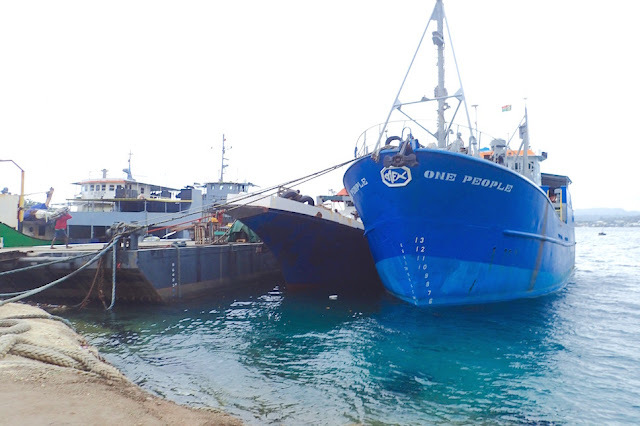 In fact, in Tonga on Sunday, other than a few restaurants, by law, all businesses are closed. 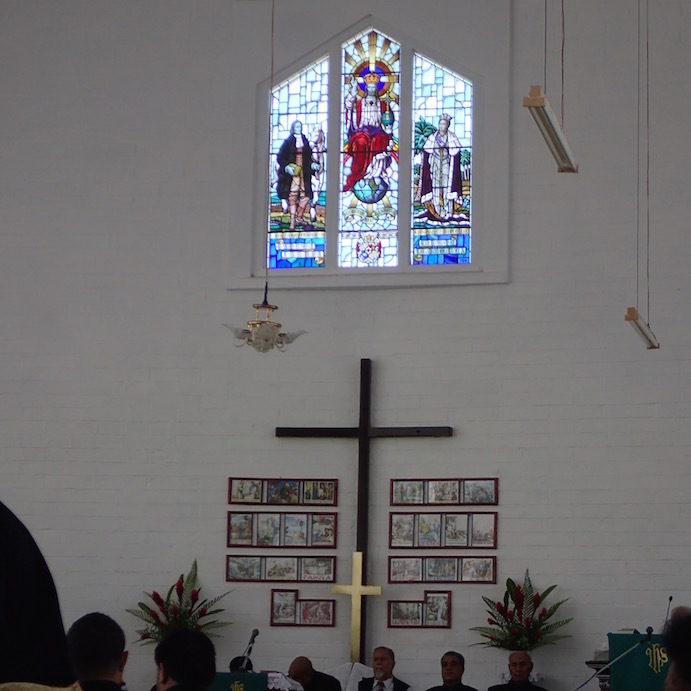 at a Wesleyan church in Neiafu. 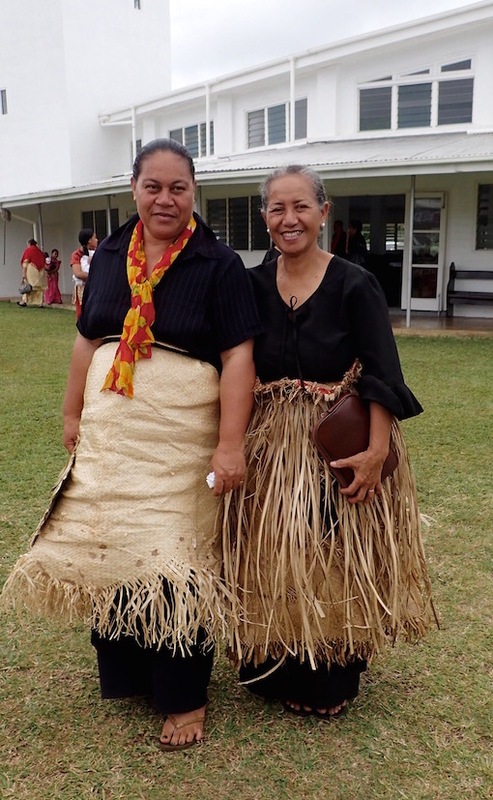 To attend a church service in Tonga is a true taste of their culture. 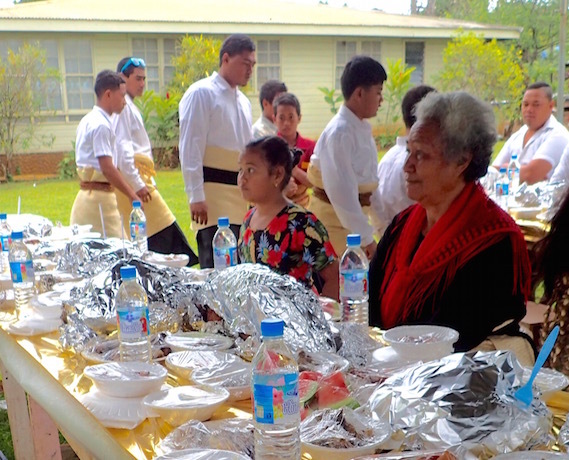 The royal Tongan church – Wesleyan, Catholic and Mormon churches appeared the most prominent and prolific. 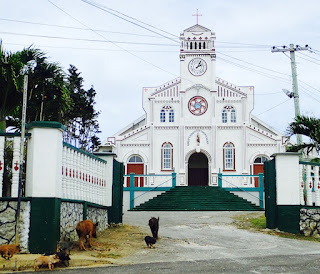 In Neiafu, we chose to attend the Wesleyan church, over the more architecturally visible Catholic church. Patty on Armagh's research tagged it as the best place to attend. 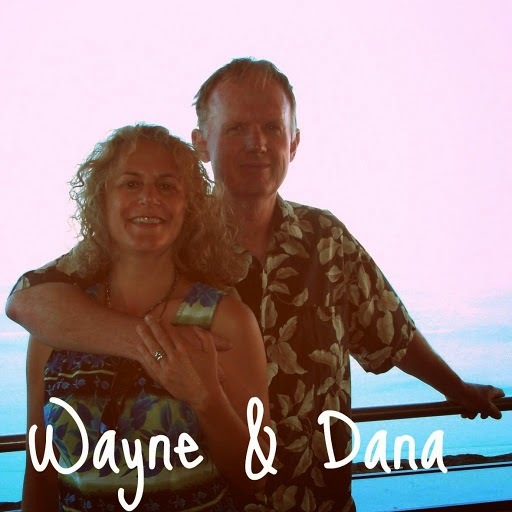 Even if you’re atheist, agnostic or more “spiritual” than into organized religion, you will be enchanted by the music (audio if not video clips to the choir to be added later). Of course, given my meager Tongan vocabulary is limited mostly to “thank you” and “thank you very much” there was no possibility the all-Tongan sermon message would offend me. As in the USA (and everywhere? 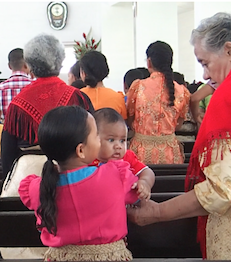 ), there was still the predictable sermon arc – the rise and fall of [Tongan] speech, first admonishing, then entreating (and again, and again). Even without understanding the language, I am betting the sermon went something like this…. 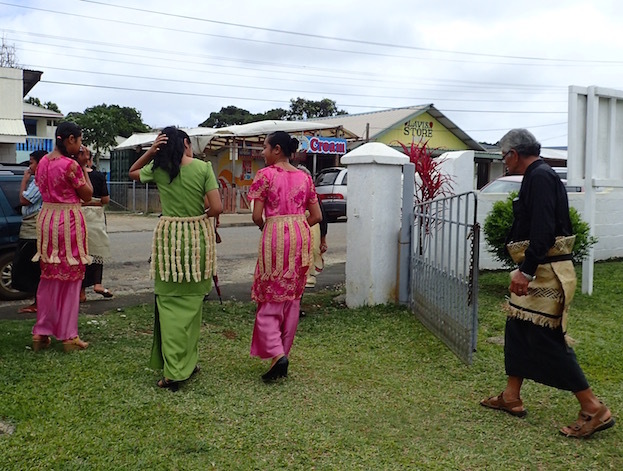 Churchgoers in their Sunday best, exiting the church. Neiafu, Tonga. No charge for those of you who’ve been searching for a sermon template. For the more irreverent, I suggest trying the template out as a MadLibs drinking game. Don’t tell your fellow compatriots it’s a sermon template. Get a little more specific on “fill in the blank.” Encourage loopiness and bawdiness. Uproarious results are sure to follow, particularly among the more loquaciously creative. Perhaps it will inspire you to form your own unique church. after the service and at the church lunch. In fact, we found out afterward, the service was a dedication to two girls whose continued schooling was funded though church and community donations after the demise of the girl’s parents. I’ve read it’s common for church members to be required to tithe as much as 30% of their income, even if it means selling off family heirlooms come collection time. the church lunch, after the service. 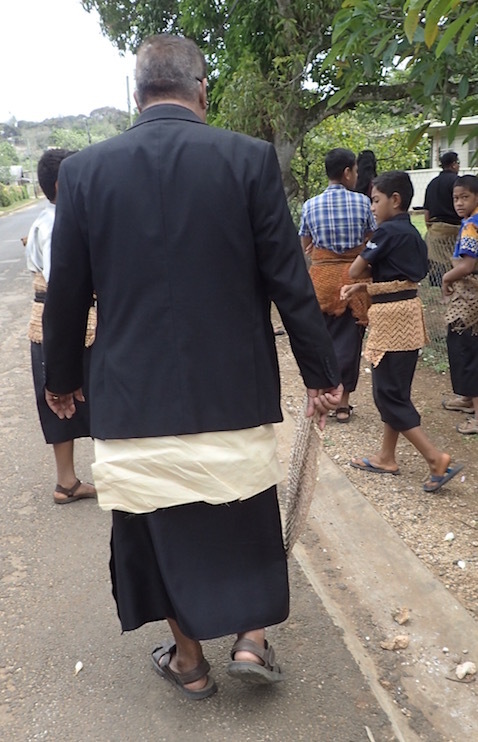 The local Neiafu Chief of Police chatted with us as we entered the church. Afterward as we left the church, he asked us if we had plans for lunch. We did not. He invited us to join the post-church lunch, held in honor of the two girls. We joined the crowd at the long picnic tables set up under a canopy in the Police lot, near the church. 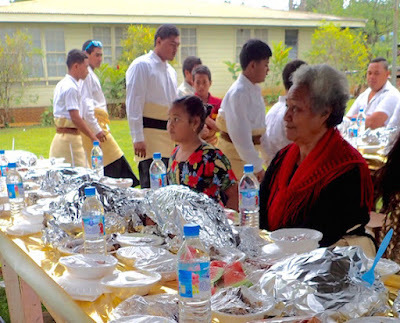 Throughout the meal, church elders (all male – as was the choir [though some women from the congregation sang along]) continued to make speeches, tell jokes and read prayers. The meal was generous…. Whole roast pig, fried chicken, ribs, oka (Tongan version of poisson cru – raw fish “cooked” in a lime-based marinade with coconut milk), lu (meat mixed with coconut milk and onion, wrapped in taro leaves and smoke-cooked in an underground [umu] oven), octopus, taro, sweet potato, potato salad, corned beef salad, curry, watermelon…. At the meal’s end, ice cream was served. otherwise formally dressed males who wore distinctively bright-colored sunglass frames. Olivia, whose English was excellent, also talked with us after the service, and at lunch. She was one of many Neiafu Tongans who upon learning we were departing yachties, said they would pray for us, for God’s blessing for a safe voyage. Patty of Armagh, thanked them, and assured them that with so many prayers for us, we would indeed have a safe passage. Our passage from Neiafu to Ha’apai was one of the smoothest we’ve had this year. Prayer, planning or just plain good luck? Who knows? A little blessing can’t hurt though, especially when it’s heartfelt. 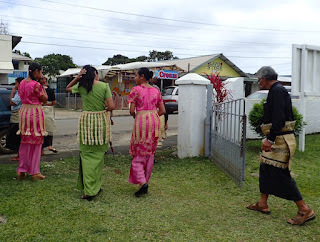 This is a recent retrospective from our time in Neiafu, the primary population center in Kingdom of Tonga's Vava'u Island group. We were anchored at S8.39.443 W173.58.965. We were there September 16 - October 19, 2015. We are currently in Opua, New Zealand, at the Bay of Islands marina, S35.18.826 E174.07.312. Since we left Jacksonville Florida in December, 2014 -- less than a year ago -- we've sailed over 10,000 miles. Our most recent stretch, from Tonga to New Zealand was over 1,000 "crow flies" miles, with a stop in between at remote, primitive an surreal Minerva Reed.